These inroads are the culmination of a significant push and investment on all fronts to develop Georgia’s tourism industry into sustainable major driver to improve its overall global economic position. In 2015, the Georgian government partnered with the World Bank to develop a cohesive strategy to attract high-value tourists from around the globe. Georgia has always been synonymous with a culture of hospitality and warmth, visitors are said to be “gifts from God.” In Soviet times its Black Sea resorts were a big draw along with its celebrated cuisine and wine culture. But after the breakup of the Soviet Union tourism began to decline due to crumbling infrastructure, corruption, failure to collect tax revenues and political unrest. Since 2004 the government has simplified the tax code, improved tax administration, increased tax enforcement, and cracked down on petty corruption, leading to higher revenues. The World Bank has praised Georgia’s anti-corruption efforts and is working closely with the country to modernize its tourism industry. Georgia has all the makings of the next great tourist destination -- an impressive list of UNESCO world heritage sites, rugged alpine villages with monasteries dating back to the Middle Ages and a renowned cuisine. But perhaps more than any other facet of its tourism industry, Georgia’s esteemed wine culture may ultimately put it on the map. Georgia has distinct wine traditions dating back 8,000 years, picturesque hill towns reminiscent of Italy’s Tuscany and hundreds of indigenous grape varieties. 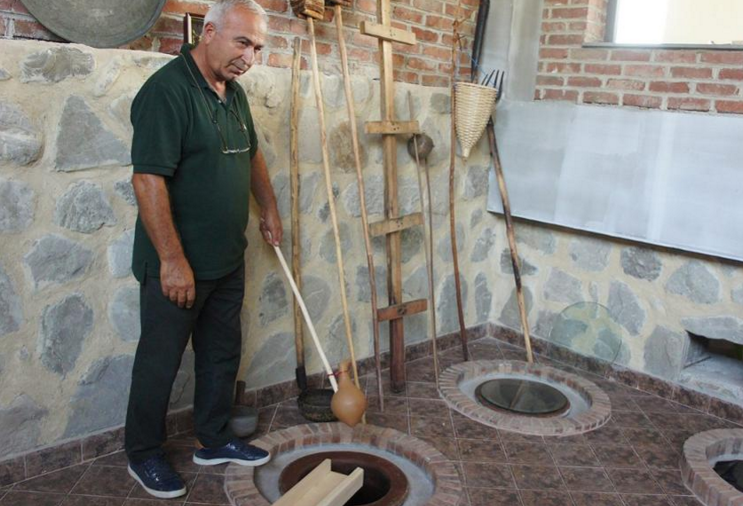 In Kakheti, one of the most prominent wine regions in the country, monks have been making wines in Qvevri, large clay vessels, since the Middle Ages. The Qvevri are filled with crushed grapes, skins and seeds then buried to allow for fermentation. Georgians refer to the nine month long process that forgoes sulphites and added chemicals as “leaving the wine with its mother before it's’ born." The Qvevri method is increasing in popularity with vintners who recognize the benefits of natural and organic wine-making. At Pheasant’s Tears, a restaurant and vineyard founded by American John Wurdeman and his Georgian wife, Ketevan, they use naturally occurring yeasts to achieve wines of unique character and sophistication. Underscoring an upbeat mood about the economy, many young Georgians who were educated abroad are returning home to spur development in many business sectors and tourism start ups. Nino Turashvili, who works with the Georgian National Tourism Administration (GNTA), is a perfect example of young and mobile professional who has returned with knowledge and theory to make an impact on the country’s tourism industry. “There has always been a culture of hospitality in Georgia,” she said. “But we need to teach local small business owners about standards of modern tourism industry and at the same time keep authentic the Georgian spirit of generosity and hospitality”. Small business owners like Giorgi Khutsishvili who studied medicine abroad before returning to help modernize his family’s business have sought foreign investors eager to promote Georgian products unknown outside the country. Take Khutsishvili, he is on a mission to introduce the world to Churchkhela, a Georgian delicacy made by threading shelled nuts onto string with a needle then dipped several times into a mix of wine, spices and flour. Each layer is left to dry in the sun before the next resulting in a chewy, confectionery-like shell that resembles a sausage. Churchkhela has long been an obsession at home, but now there is a demand abroad for Khutsishvili’s products which are sold in European and American markets and on Amazon. At a recent travel forum the Georgian government laid out its ambitious goals for the tourism industry: Build 25 new hotels in next two years, improve infrastructure, work with locals to develop guest houses along the Black Sea coast and elevate tourism standards. The country’s overall goal is to reach $6.6 billion in tourism dollars by 2025. It’s strategy rests in part on strategic partnerships with Google and travel websites such as Tripadvisor and Expedia. And on innovative internet and TV campaigns like the one celebrating the arrival of the country’s six millionth man, Jesper Black. As for Black, he’s moved to Georgia. One week simply wasn’t enough. He told us he stuck around to travel and happened to land a gig on Dancing With The Stars Georgia. When Black first arrived in Tbilisi he was welcomed with a massive billboard with his picture on it that said, “He has arrived.” It seems so has Georgia, at least when it comes to the tourism strategy.